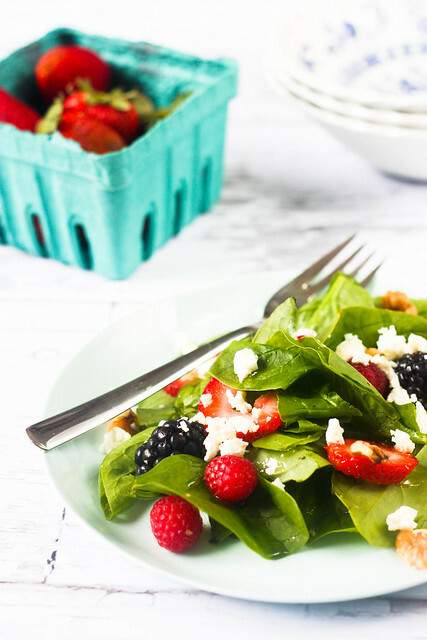 Summer salads that include berries are absolutely the best. Usually it's just a handful of blueberries or a couple of sliced strawberries on the top. 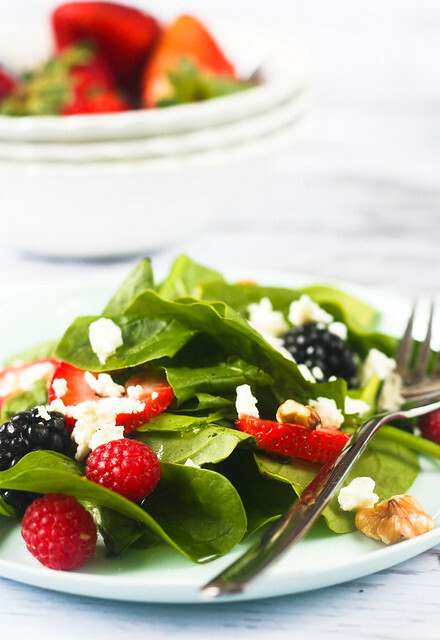 But why not make what amounts to a berry salad with some handfuls of spinach thrown in? That way, you won't have to eat around the strawberries, making sure you only get one slice per bite so they'll last. You wouldn't have to worry about picking out too many raspberries all at once, because there will be plenty. I made a huge bowl of this salad to last all week, for lunches brought to work, and snacks when we got home. 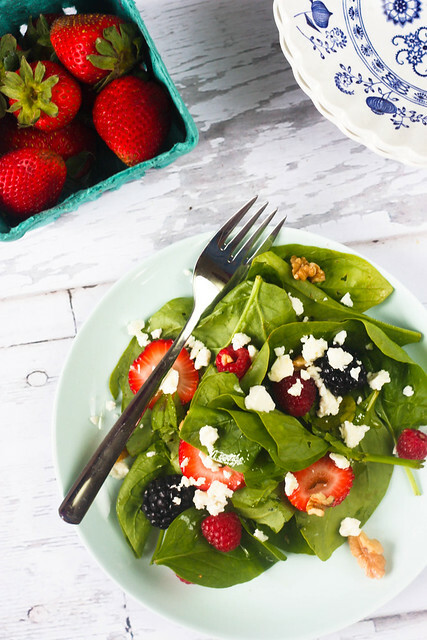 If you're thinking of doing the same, toss the berries with the spinach, but leave the honey vinaigrette to the side as well as the feta. Add both to individual servings only as you use them so that nothing gets soggy from being stored. I'm not really going to give you precise amounts because, well, it's a salad. Add what you want in the amount that you want it. Don't see your favorite berry here? (We left out the blueberries, which were kind of mealy and gross. But slices of peach or nectarine would be great.) Add them. Don't like walnuts? Leave them off. Whisk together the olive oil, vinegar, honey. Season to taste with salt and pepper. In a large serving bowl, toss the fruit together with the spinach. Fold in the feta and dress with the honey vinaigrette. Serve. I know what I'm having for lunch today :) Best part of summer if you ask me.